Online slots with a TV show theme. 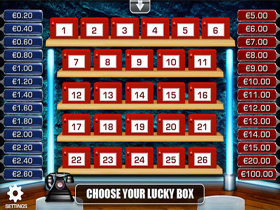 Play slots that feature TV shows and game shows.Deal or No Deal, Fumis Fortune, Who Wants to be a Millionaire, The Price is Right and The X Factor Slot. We can't seem to find any online casinos that still offer this slot. 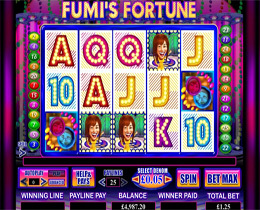 Fumi’s Fortune is a fast-paced Japanese game show featuring 5 reels and 25 pay lines. There are 7 bonus features that may be activated during any of the games, and include free spins and multipliers. 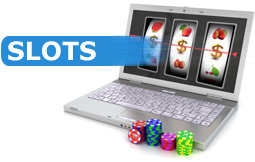 This game is ideal for all types of gamblers as the betting ranges from 1c up to $20. 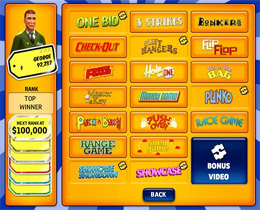 The Price is Right Slot consists of 20 pay lines and has 20 levels. Tokens will be rewarded to players throughout the game. There are also two bonus games with several free spins and all winnings will be multiplied. 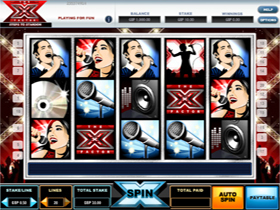 The X Factor contains 5 reels, 20 pay lines and is a non-progressive, Random-logic Video Slot. It features a scatter icon, the opportunity to win a Boot Camp inspired free spin and to take on the judges in the bonus round. Players could win up to 200x the line stake. This slot is ideal for low and mid stake players. 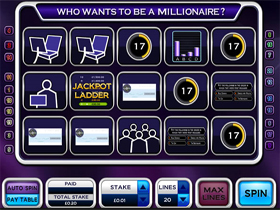 The Who Wants to be a Millionaire consists of 5 reels and 20 pay lines and players may only bet one coin per pay line. It features three bonus rounds and the aim of the games is for players to climb the ladder to win cash awards until they run out of lifelines.